The 1950's marked an extraordinary era of music experimentation and development in the current of emerging European composers. Amongst these, Iannis Xenakis would begin to compose his first mature works. He would reject the avant-garde trend of serialism and build his own aesthetic principles founded in the world of abstract mathematics, which, amongst other things, applied a unique philosophy of 'chance' to music. The style of music which arose from these principles he labeled 'stochastic music,' and the first two works which arose in this style, "Metastaseis" and "Pithoprakta," set the foundation of his aesthetic principles that he would go on to develop and experiment with for the rest of his musical career. In assessing how Xenakis came to use aesthetics grounded in abstract mathematics one must examine his early life prior to mature music composition. This involves examining his childhood, education, influences and experiences with the Second World War. 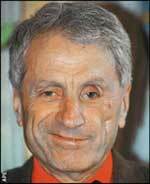 From an early age it seems Xenakis had been mapping out his intelligence and capabilities as though for his benefit alone.1 He recalls, in a 1987 article, that at around twelve or thirteen years of age he would be practising piano, reading about astronomy for hours on end and studying mathematics and archaeology. 2 He confidently disdained schoolwork in favour of his own personal reading, and left school at the age of sixteen without any distinguishable academic record. 3 It was at this time, in 1938, that he enrolled in the Athens Polytechnic to study engineering, where he undertook courses in mathematics, physics, law and ancient literature. 4 He also took up studying harmony and counterpoint with Aristotle Kondourov "who impressed upon Xenakis the necessity of absolute rigour and discipline in the pursuit of composition." 5 Therefore the assimilation of interests that shaped his aesthetic principles in music, namely those of mathematics, physics, astronomy and ancient literature6 can be traced back to his early years of education, and his highly disciplined approach to formalizing music can also be traced back to his first formal music lessons with Kondourov in these years. Evidently, Le Corbusier and the influence of architectural work gave Xenakis impetus to apply a visual approach to music by applying the technical facilities inherent in architectural design to the same plateau as music design. Although Messiaen and Le Corbusier acted as final catalysts in assuring Xenakis' mature compositional style to be born, the impact of the war definitely marked itself on him, as it did with all composers at that time. As Elisabet Sahtouris wrote, in her 1998 article "The Biology of Globalization," "some of the greatest catastrophes in our planet's life history have spawned the greatest creativity" 12; this would hold true as a result of the highly experimental compositional climate that came about in Europe during the 1950's. The Second World War definitely impressed itself on European composers of this period. Therefore Xenakis' eagerness to embrace chance and chaos and try to understand what role these concepts play in our world led to what role they could play in the creation of his music. In "Metastaseis," Xenakis confronted most of the fundamental musical problems and in effect "Metastaseis" presents the foundation for the style and aesthetics he would follow through for a good deal of his musical career with the concept of textural sound composition. In his 1954 article "Les Metastaseis," Xenakis describes this concept: "the sonorities of the orchestra are building materials, like brick, stone and wood... the subtle structures of orchestral sound masses represent a reality that promises much." 26 Le Corbusier's influence and architectural work was prominently realized in "Metastaseis" as the original plotting of the massed glissandi were done on the same graph paper that was used for plotting building structures. This reflects Xenakis' idea of a musical 'space-time', where pitch is represented on the y-axis and time on the x-axis. 27 "A two-dimensional space is created where potentially time-independent musical structures can be contained in a temporal setting." 28 He later used plotting of string glissandi in "Metastaseis" as the curvature for the walls in the Philips Pavilion (constructed for the 1958 Brussels World Fair). Therefore, the style of 'stochastic music' that Xenakis created amidst a wilderness of other experimental trends was to stand out as his own unique entity. 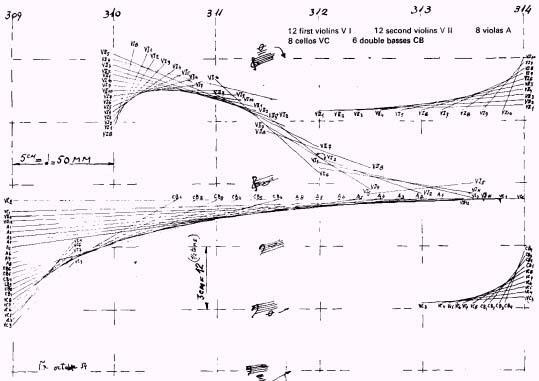 Inspired by 'noisy' and/or violent sonic phenomena such as demonstration rallies in the Second World War or the song of cicadas in a summer field, Xenakis applied mathematical theories and principles in assembling the makeup of this music that grounded its sonic principle as textural sound composition. The influence of architecture, where Xenakis also used abstract mathematics as his aesthetic foundation, grounded a means of technical facility whereby Xenakis was able to visualize music graphically from an 'externally-relative' position. Aesthetically, theories such as the kinetic theory of gases and Probability theory became two major standpoints in organizing the musical materials in his first two works "Metastaseis" and "Pithoprakta." These works had assembled the aesthetic means of a mathematically formalized organization of music and acted as the foundation for a myriad of works which were to develop and experiment with these aesthetic means for the rest of his career. Nouritza Matossian, Xenakis, (London: Kahn & Averill, 1986), p. 16. Iannis Xenakis, "Xenakis on Xenakis," Perspectives of New Music, vol. 25, no. 1 & 2 (Winter, 1987), p. 18. Ancient literature would be of more significant inspiration later in his musical career from the early 1960's onwards, where he would apply names from Ancient Greek tragedies as the titles to his works, and write music set to Greek tragedies (for example Oresteia), thus it is of little relevance in the purpose of this essay. Mario Bois, Iannis Xenakis: The Man and his Music: A Conversation with the Composer and a Description of his Works, (Westport, Connecticut: Greenwood Press, 1980), p. 5. "There you have got parallel fifths." "Yes, but I like them." "But all this, it's not music, except for the first three measures, and even those..." And the madder he got, the madder I got. I thought that he was a free-thinking man. How could he make a thing out of parallel fifths, especially after Debussy, Bartók, and Stravinsky? Elisabet Sahtouris, The Biology of Globalization, available at http://www.ratical.org/LifeWeb/Articles/globalize.html, last accessed 12 August 2002. Iannis Xenakis, Formalized Music: Thought and Mathematics in Composition, (Bloomington: Indiana University Press, 1971), p. 9. Peter Hoffmann, "Iannis Xenakis," The New Grove Dictionary of Music and Musicians, vol. 27 (London: Macmillan, 2001), p. 608. Xenakis, Formalized Music: Thought and Mathematics in Composition, p. 9. Robert P. Morgan, Twentieth-Century Music, (New York: Norton, 1991), p. 392. Xenakis, Formalized Music: Thought and Mathematics in Composition, p. 8. Bois, Iannis Xenakis: The Man and his Music: A Conversation with the Composer and a Description of his Works, p. 12. Paul Griffiths, "Aleatory," The New Grove Dictionary of Music and Musicians, vol. 1 (London: Macmillan, 2001), p. 346. Khai-Wei Choong, Iannis Xenakis and Elliott Carter: A Detailed Examination and Comparative Study of Their Early Output and Creativity, (Brisbane: Griffith University, 1996), p. 32. Griffiths, "Aleatory," The New Grove Dictionary of Music and Musicians, p. 342. Xenakis, Formalized Music: Thought and Mathematics in Composition, p. 4. Hoffmann, "Iannis Xenakis," The New Grove Dictionary of Music and Musicians, p. 607. Xenakis, Formalized Music: Thought and Mathematics in Composition, p. 3. Hoffmann, "Iannis Xenakis," The New Grove Dictionary of Music and Musicians, p. 608. Choong, Iannis Xenakis and Elliott Carter: A Detailed Examination and Comparative Study of Their Early Output and Creativity, p. 36. Paul Griffiths, "Xenakis: Logic and Disorder," Musical Times, vol. 116, no. 1586 (April, 1975), p. 329. Christopher Butchers, "The Random Arts: Xenakis, Mathematics and Music," Tempo, vol. 85 (Summer, 1968), p. 3. Acknowledgments: I would like to thank Dr. Philip Truman for his helpful editing advice.